Taken from Manos Del Uruguay: "Mirto." 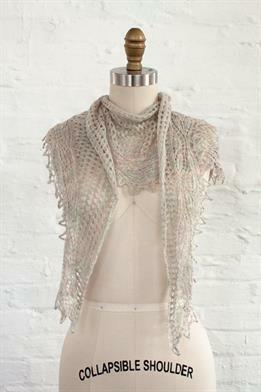 A lovely lacy shawl with a mesh body and delicate border. This pattern is from Manos Del Uruguay - Mirto. Size US 3 straight and 32" circular needles (or size needed to obtain gauge) are required but not included. Finished Measurements: 77.75" wide and 11.5" deep after blocking. Gauge: 19 sts and 38 rows over 4" in Lace Pattern. Color Shown is N6966 Tiza. Nova Platina Single Pointed Needles - US 3 (3.25mm) - 10"
$29.00 -- Kit price including yarn only (no book or pattern).